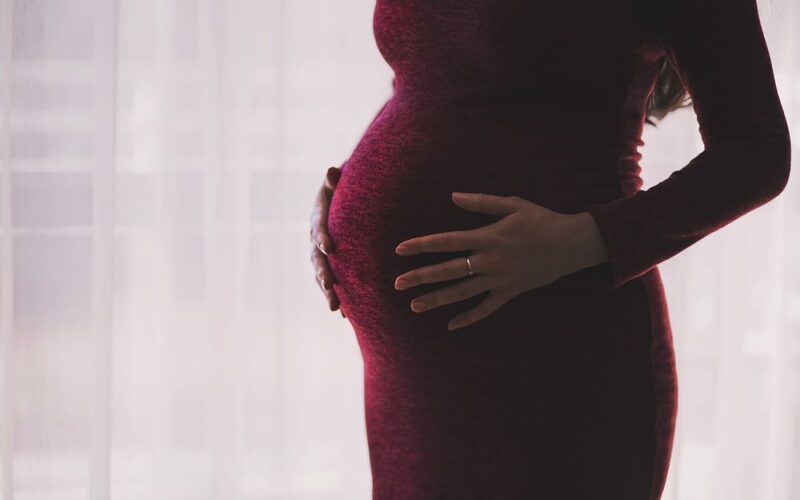 Pregnancy heartburn or acid reflux: whatever you call it, that uncomfortable, burning sensation and constant need to burp is one pregnancy symptom all moms-to-be could do without. Towards the end of both of my pregnancies, I had persistent heartburn at night the minute my head hit the pillow. I’d try to “burp” myself like a baby, hitting my back and my chest to try to relieve some of the pressure and prop my head up with pillows so I could get a few hours of shut-eye. Although it helped a bit, I was happy after I gave birth to no longer deal with it. Approximately 30 to 50 percent of women will complain about pregnancy heartburn. The reason is primarily pregnancy hormones—progesterone and relaxin—which cause the lower esophageal sphincter, or the muscles around the esophagus to relax and push food acids back up. Eating alone can also cause acid reflux, so avoiding food two hours before bedtime is a good idea. Triggers can vary between women but spicy foods, foods high in fat, and those that contain caffeine (chocolate included) or citrus usually cause heartburn. A good rule of thumb: stick to whole foods, plenty of fruits and vegetables and eat meals you make at home so you know exactly what you’re eating. Here, 10 healthy foods that fight pregnancy heartburn. Ginger does double duty for both morning sickness and acid reflux. It’s both anti-inflammatory and well known to help with GI discomfort. Add ginger to a homemade green juice or green smoothie, grate it into a stir-fry or sip on a soothing cup of warm ginger tea. A great source of potassium, bananas are alkaline so they can fight acid reflux. Add a few slices to your breakfast or enjoy as a snack when hunger strikes. Fennel, or “Finacchio,” is an herb thought to cleanse the palette after a large meal—at least in many Italian-American families like mine. Whether it’s an old wives’ tale or not, fennel is used to help relieve digestive issues including heartburn, gas and bloating. If you like fennel’s mildly licorice taste and crunchy texture, chew on some or chop it up and add it your meals. During the second and third trimesters, when morning sickness usually subsides and you have more of an appetite, fill up on green leafy vegetables which are packed with nutrition, filling fiber and are alkaline, so they won’t cause acid reflux. Broccoli, kale, spinach, celery and cauliflower are all great choices. Greek yogurt is an excellent source of protein and calcium and can prevent pregnancy heartburn. Since most brands of yogurt are high in sugar, choose plain Greek yogurt and add low glycemic fruit like blueberries or raspberries which also have filling fiber. If you’re pregnant during the summer or live in a warm climate, you’re probably craving fresh, sweet fruit that has a high water content like watermelon, cantaloupe and honeydew, which are all refreshing and also keep acid reflux at bay. Well-known as an herb to aid digestion and relieve stomach upset, parsley also works well in green juices and in most dishes. Sources of complex carbohydrates like oatmeal, brown rice and quinoa are high in fiber so they’ll help you feel satiated and ward off acid reflux. Dairy can cause stomach upset in some people but almond milk is alkaline and a good source of calcium. Enjoy a glass alone or use it to make a breakfast smoothie. Chicken, turkey or lean cuts of beef are all good sources of protein which will help you feel satiated and quell acid reflux. Be sure that the meat you eat however, has the skin removed, grilled, broiled, baked or steamed and is thoroughly cooked to avoid harmful pathogens. Avoid meats that are fried or have creamy or acidic sauces, which can cause acid reflux.